Background: In the field of PCPs or MOF, besides strategies to design compounds with huge porosity, a great trend is the molecular engineering of the ligands. Their functionalization allows rendering walls of pores as an active surface able to specifically interact with guest molecules. Quite recently, bipyridinium (called also viologen) cores bearing carboxylate groups have been considered as ligands in the field of PCPs because of the electron acceptor character of bipyridinium units which are able to strongly interact with electron donor guest molecules. Objectives: The main objective of this study was to prepare new PCPs materials based on the viologencarboxylate ligand 1-(4-carboxyphenyl)-4,4'-bipyridinium. Methods: The compounds [Cd(hpc1)(BPDC)].2H2O (1) and [Cd2(hpc1)2(BPDC)(BPDC)].4H2O.DMF (2) have been synthesized from a mixture of Hhpc1Cl, Cd(NO3)2, H2BPDC -biphenyl-4,4′-dicarboxylic acid- (and H2BDC -terephtalic acid- for 2), DMF, EtOH and H2O heated at 100°C for 48h in a 25mL teflon-lined stainless steel autoclave, and slowly cooled to room temperature in 8 hours. Crystals were collected, washed with DMF and air-dried. X-ray diffraction data were collected on a Bruker-Nonius KAPPA-CDD with MoKα radiation (λ=0.71073 Å) for 1 (T= 293 K), and on an Agilent Supernova with CuKα radiation (λ=1.5418 Å) for 2 (T= 150 K). All experiments were carried out under a nitrogen atmosphere. The methanol adsorption isotherms of 1 and 2 at 298K were measured using a home-built McBain type balance. N2 adsorption isotherms at 77K were recorded on a Micromeritics ASAP 2020 instrument. In both cases before measurements the solids were degassed under vacuum (<10-5 hPa) at 150°C for 4h. Results: Two porous coordination polymers based on Cd2+ cations and the zwiterrionic viologencarboxylate ligand 4,4'-bipyridinium-1-(4-carboxyphenyl) (hpc1), [Cd(hpc1)BPDC].2H2O (1), and [Cd2(hpc1)2(BDC)(BPDC)] .4 H2O. DMF (2) have been discovered. The structures of these two compounds are isoreticular with half BPDC2- anions present in 1 being replaced by BDC2- anions in 2. The overall structures which result from the interpenetration of five 3D networks, exhibit channels containing guest molecules. Upon desorption, a breathing effect of the structure of 1 is observed as revealed by X-ray diffraction and methanol adsorption measurements. In fact, methanol adsorption on 1 occurs through a two-step isotherm characteristic of a gate opening in a flexible framework, while 2 exhibits a type I isotherm. 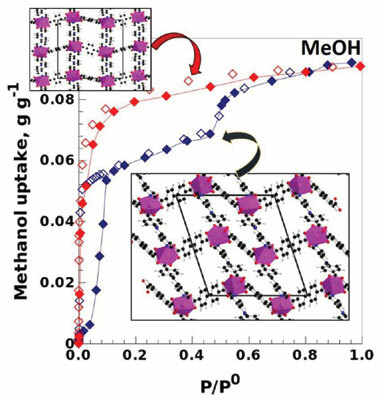 Interestingly, the MeOH adsorption allows to suppose that the closed rhomboid channels which are present in the room temperature crystal structure of the as-synthesized compound become open to accommodate methanol molecules when the MeOH pressure is high (P/P°>0.5). Conclusion: Our results show that the association of Cd2+, the 4,4’-bipyridinium-1-(4-carboxyphenyl) viologen- carboxylate ligand and either the terephthalate anion BDC2- or the mixture of BDC2- and the biphenyl- 4,4′-dicarboxylate BPDC2- anion afford two isoreticular PCP compounds whose different structural characteristics, rigid vs flexible, have consequence on their adsorption properties. Porous coordination polymers, viologen, adsorption, breathing effect, viologen-carboxylate ligand, isoreticular.